Sightseeing! Time to see the nation’s Capitol! 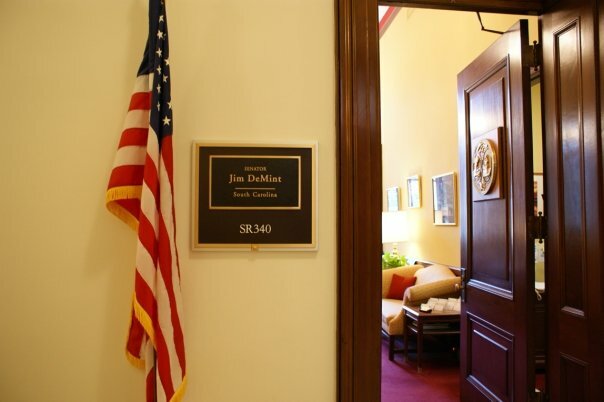 We had a tour scheduled through Senator DeMint’s office, and didn’t want to be late, since we were told that if we missed it, we’d have to wait for the next tour. 🙁 So, as fate would have it, we left a little later than we should have, and we were driving to the Capitol. Now please picture this. It’s around 8:00 in the morning, driving into DC from Springfield. Everybody and their brother was going to work just at that time, and we were CRAWLING along the interstate. It was also raining, and Jonathon was driving through an unfamiliar location with heavy traffic on a time limit. It was very exciting. I know I have a few more gray hairs from that. So thankful for God’s protection! 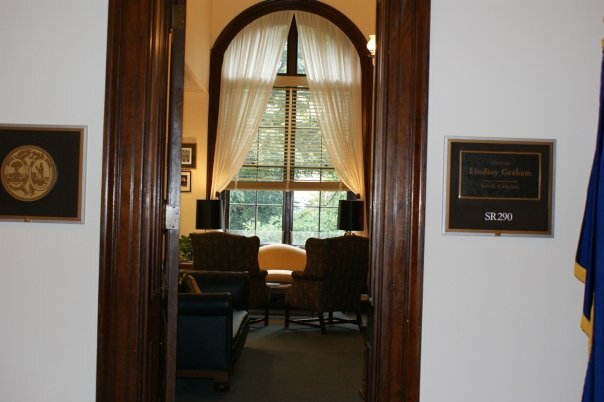 Although we were late, it turned out not to be a problem for Sen. DeMint’s gracious staff. The whole time we were touring DC we were thinking about the movie “Mr. 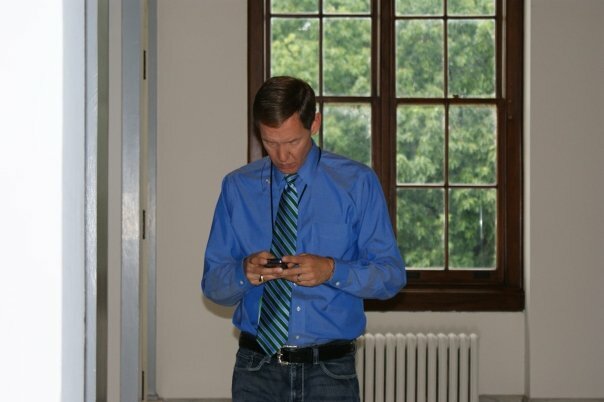 Smith Goes to Washington”. 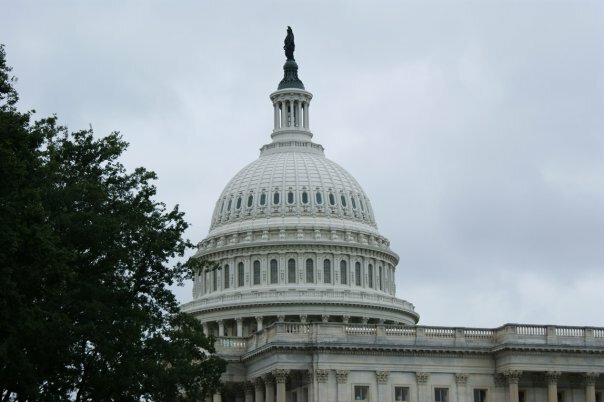 As soon as we saw the Capitol dome we yelled “There it is! !” just like Mr. Smith did. We met Sen. DeMint’s staff in the Russell building where his office is located. 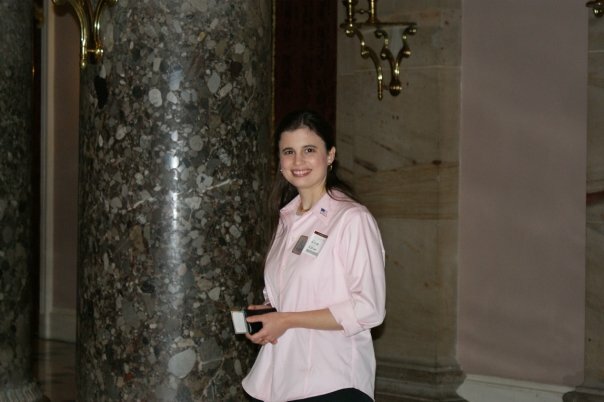 It’s a beautiful, stately place, and so much fun to walk down the hallways and see the actual offices of the U.S. 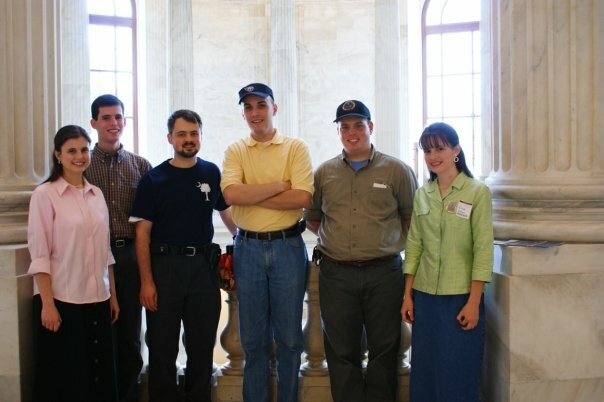 Senators. 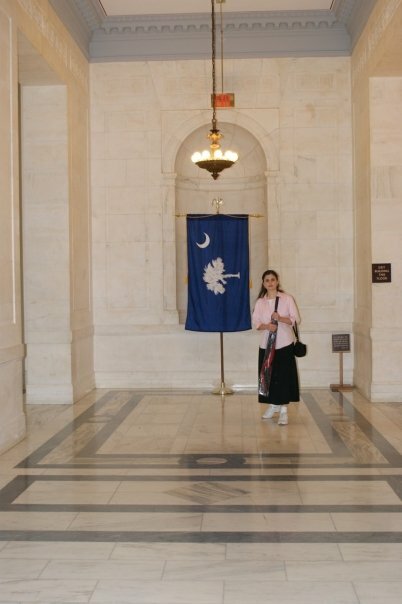 We saw a huge SC flag hanging at the end of one of the hallways, and found Sen. Lindsey Graham’s office there. I briefly wondered if I could leave a note for him with his staff, but didn’t take the time to find out. 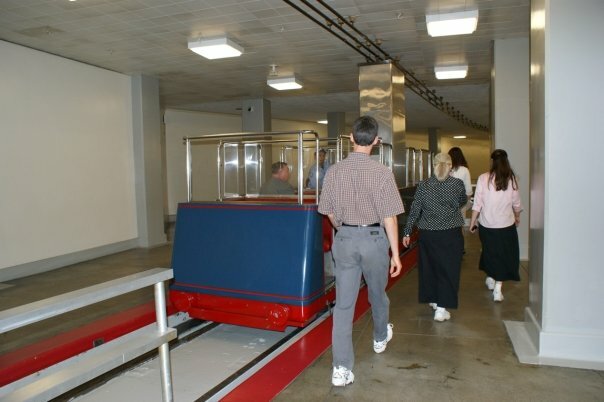 Our tour guide, Harrison, took us to the Capitol building via an underground shuttle. It was convenient, but I couldn’t help thinking about how much taxpayer money it had taken to construct that. Our good friend and Patriot Academy buddy Aaron Snodderly and his brother James, also there for the rally, joined us for the tour. There is so much history in that place! Statues were everywhere, and we learned that the States have been donating two statues apiece to the Capitol building. John C. Calhoun was one of SC’s gifts (bless his heart }:-( ). 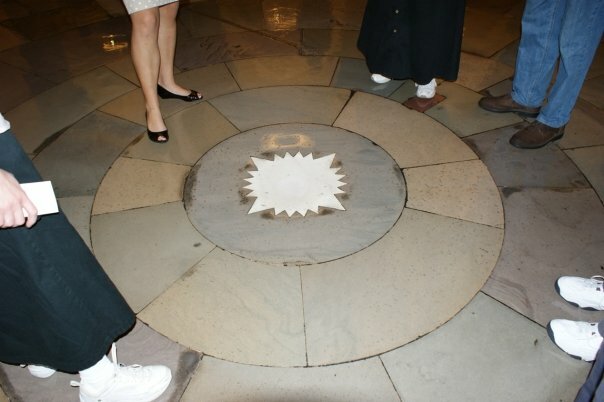 Harrison showed us a point in the building that she said is the very center of Washington. All the rest of the city radiates out from that. 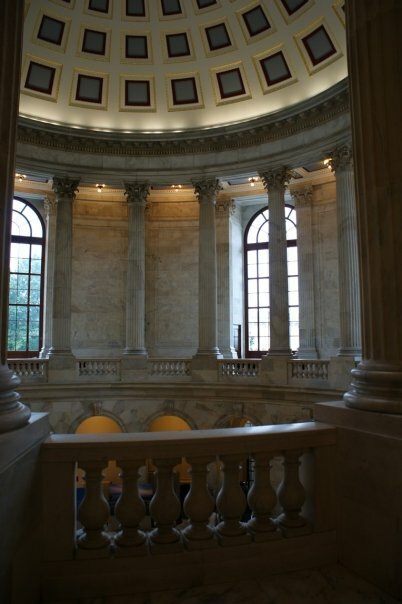 One interesting place was the Capitol rotunda. with a collection of large, historical paintings and statues all the way around. Columbus’ landing, the Mayflower pilgrims, and the baptism of Pocahontas were a few of the events depicted. There were four paintings by Revolutionary War artist John Trumball, including the famous painting of the presentation of the Declaration by the drafting committee. Harrison pointed out that in that painting, Thomas Jefferson is stepping on John Adam’s foot. Trumball did that to depict the strained relationship between the two men. 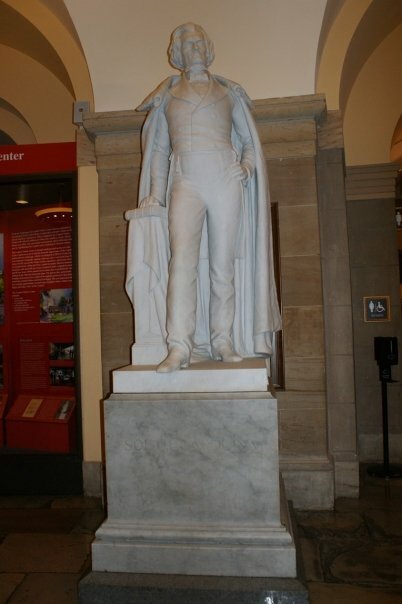 There was also a statue of Jefferson holding the Declaration, which only had his signature and that of Hancock. 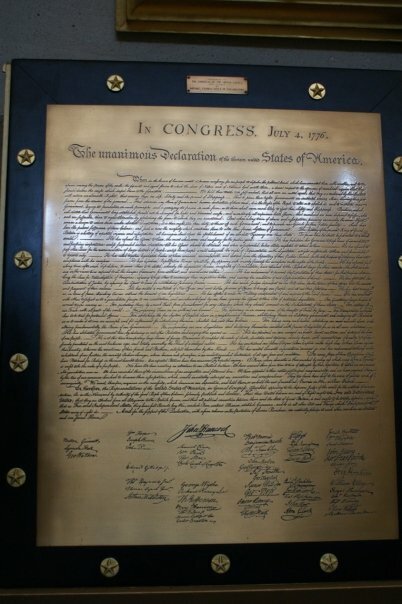 Nearby we found a large statue of the Declaration, and I found the signatures of the South Carolina delegation. Yay for SC!! 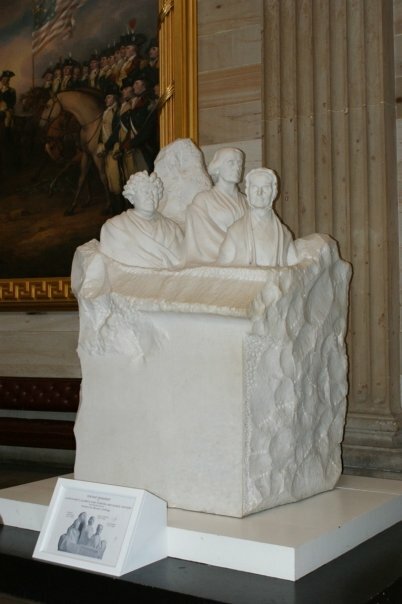 Another interesting sculpture was representative of the fight for women’s rights in America, and it consisted of three women, one of whom was Susan B. Anthony, who played a role in that struggle. The most interesting feature was that that the artist left a rough column behind the three sculpted women, and it almost looks like he intended to add someone else later. Harrison told us that that could be representative of the “fact” that women’s rights will always be a struggle (for the record, it looks like women run the nation to me – and I don’t think it’s in a good way), or that it could be that the first female president will be added there. 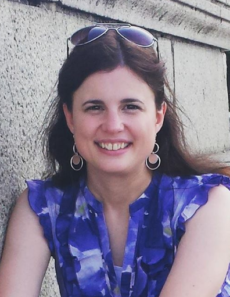 Sarah Palin? 🙂 I like that thought! 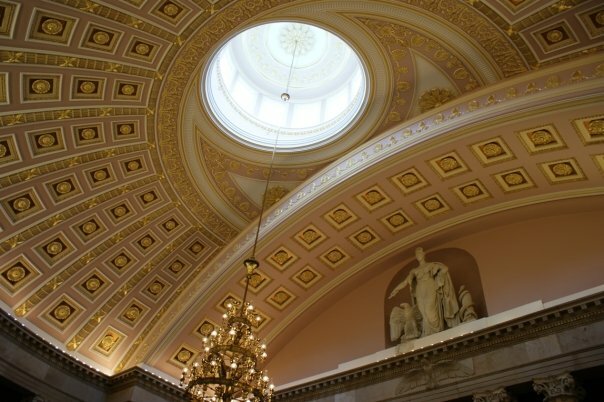 My favorite place was the old House chamber. It had been used from the beginning of the nation until we outgrew it with the addition of many more states. 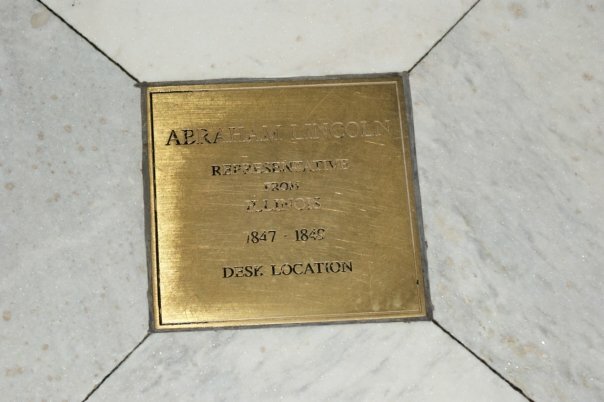 There were bronze plates on the floor scattered throughout the room, and Harrison said that they marked the desk locations for each of the Presidents who had served in the House. We were right near Abraham Lincoln’s, and looking around we saw James Polk’s, Franklin Pierce’s, etc. As soon as I found out what they were for, however, I started looking for one in particular and finally found it: John Quincy Adams. I stood there and thought about the man whose desk had stood in that spot, and the long, hard, hopeless-looking fight for the abolition of slavery that was waged from it. Adams was called “the hellhound of slavery” and when asked what kept him going in the face of all those odds, replied “Duty is ours, results are God’s.” That was one of the highlights of the whole trip. 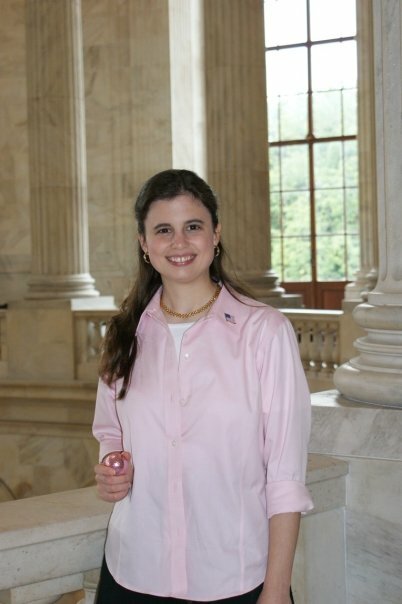 Here I am standing where the Speaker of the House sat. Ever heard of “The Bridge to Nowhere”? 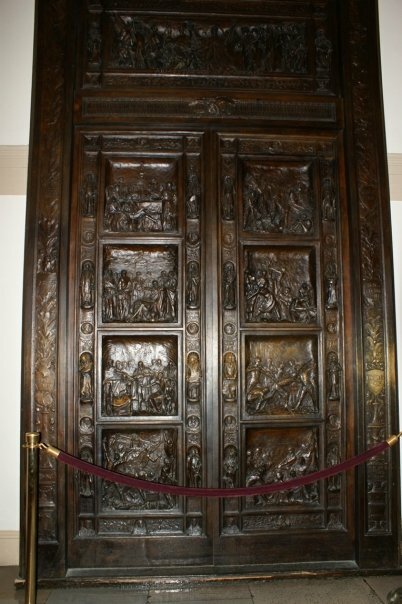 Well, these were meant to be the original doors of the Capitol building, but ended up being way too large and heavy to use. So, they put them up against a wall inside and nicknamed them “The Doors to Nowhere”.